Zanzibar’s surf spots are still a well kept secret and the potential of the waves would surprise most surfers. 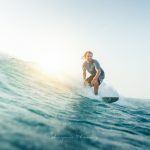 When planning a surfing holiday in Zanzibar you will find turquoise warm crystal clear water and a fun wave along the barrier reef, along with a great lifestyle and many other water sport activtities to choose from. During your time on the island you will be able to discover the best surf spots and explore Zanzibar’s uncrowded waves. Depending on your level, there are several spots to choose from and there are many more waiting to be found. Our camps are designed for both beginners and advanced sufers and trips can be individually adapted to your needs. The surf season in Zanzibar is from mid-December to mid-March and then again from early June to end of October. The waves are fairly constant for beginners (waist high) and ideal for first-timers and offer a great training ground for intermediates. After stormy days and with the right swell and wind direction also experienced surfers get their game on. You won’t find crowded surf spots anywhere on the island since the sport is still quite new to Zanzibar. A good selection of various boards is available for rent and it is not necessary to bring your own gear. 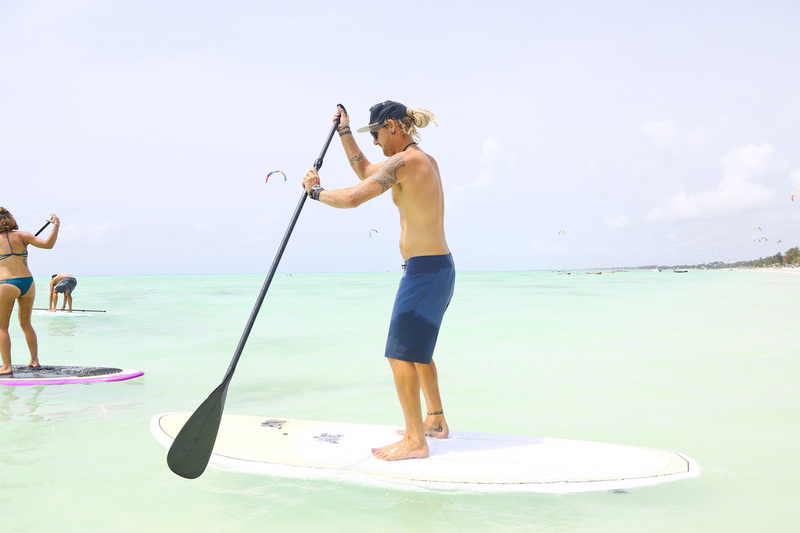 Zanzibar waves are also great for longboarding and stand up paddle surfers. The climate in Zanzibar is year around tropical with an average temperature of 28° celcius in winter and 31° in summer. The water temperature is about 27 ° celsius all year long and a wetsuit is definitely not needed. 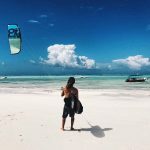 If you want to book your wave surfing holiday to Zanzibar with us just scroll down to the bottom of the page to receive an instant quote. Choose your preferred arrival and departure date, room category and choose your surfing package as well as optional extra activities. We don’t have fixed dates and you can come and stay with us any dates in season for a minimum of 5 nights. Once we’ve received your booking we will confirm availability within 24hrs. Please always tell us if your dates are flexible in the comment field, so we can offer you alternative dates in case your preferred booking dates are not available. Whats included in all Surfcamp packages? Our surfcamp package includes surf trips in small groups of 4 to 14 people. 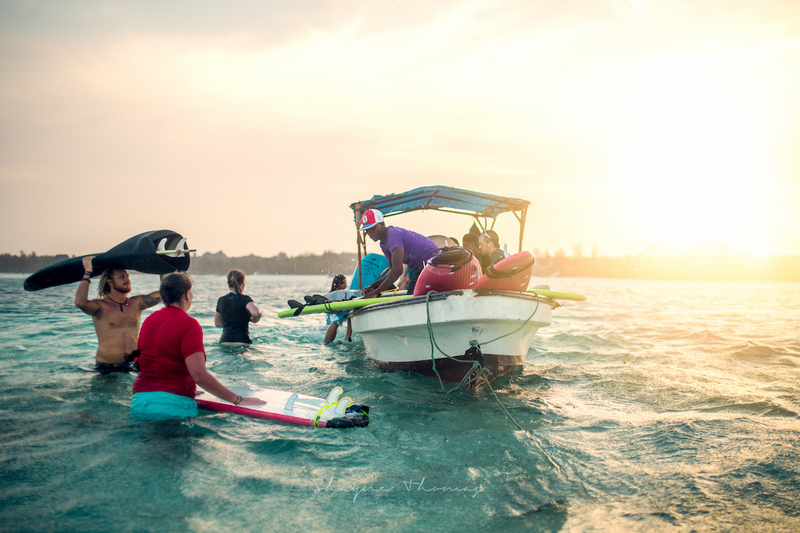 Meet other likeminded dudes and dudettes on the boat, explore the waters, try different activities and of course get to surf Zanzibars waves. 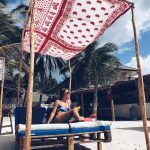 Surf in Zanzibar is very tide dependant and the trips need to be scheduled according to the tides. The spots can be reached by boat and team Aquaholics will make sure to take you to the place most suitable for your level. Each trip is around 4 hours long of which you will spend up to 2 hours in the surf with an experienced guide or instructor. For complete beginners a beach introduction is given, to make the most of your time in the water. 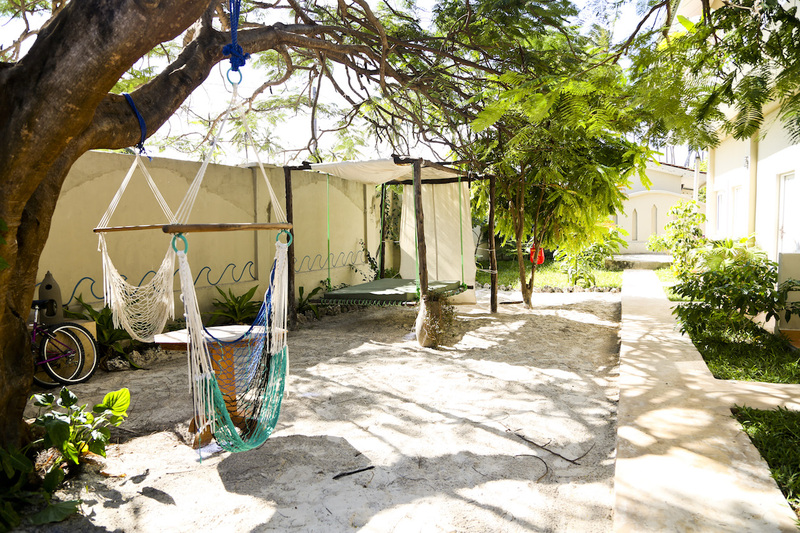 The Ebb & Flow Apartments in Paje are our Unique Kite & Surf Camps Base and located only a short walk from our Aquaholics Kite & Surf Center and the Kitesurfing Spot. 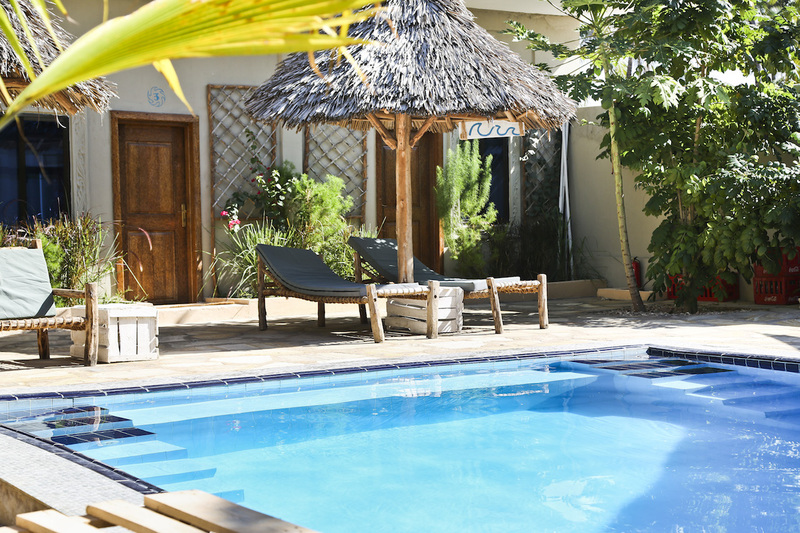 The guesthouse has a pool and is built in a cozy backyard style. 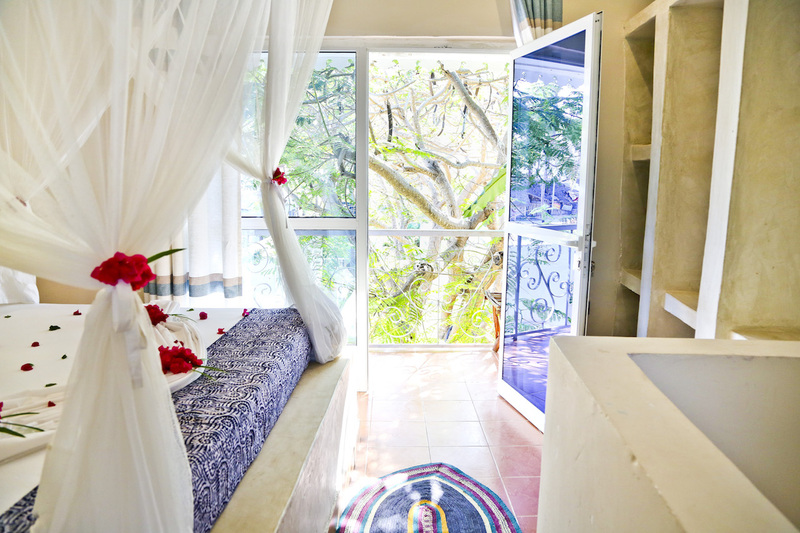 All rooms have private balcony and you have the option to choose air-conditioned room or room with fan. The bathrooms have hot water shower and there is a generator on hand for power cuts. WIFI connection can be received in the communal area, although the WIFI around the Kitecenter is generally more reliable. If you are travelling on a budget we also offer a backpackers option and you can stay in our comfortable mixed 6 bed dorm. 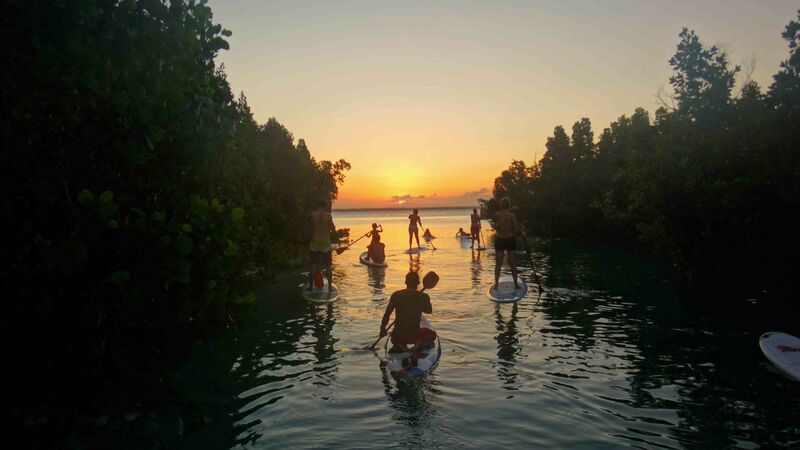 The Mangrove SUP Tour is a great way to explore a different area on the Southeast Coast. 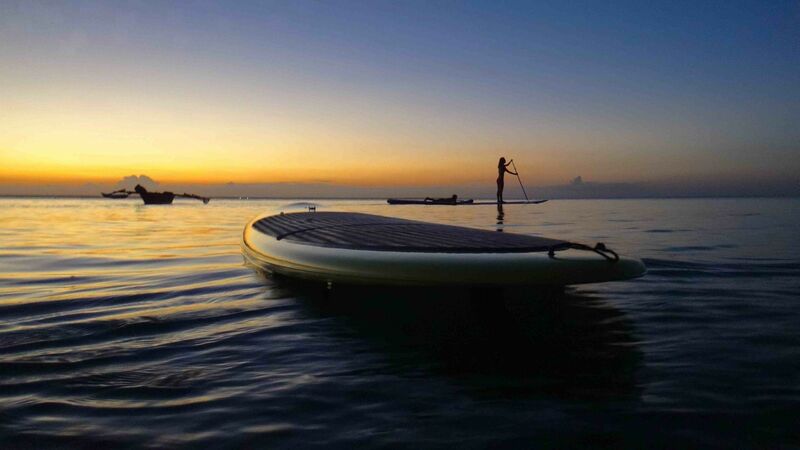 By SUP you’ll enter a whole new environment and ecosystem as you paddle through the Mangrove Channels. 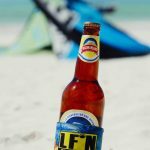 This tour is scheduled over the high tide and a perfect addition to a day of kiting. Fruits and water, as well as the gear are provided on this fun trip. There is a lot to discover along the coast and we will always provide you with infos on the places to be. Tours, Attractions and nightlife on the island – We show you the best Zanzibar has to offer. Parties take place in different locations, on different days of the week and we know where. Beachbars, excentric hotels and top notch DJs provide a great music culture and atmosphere to socialize on the South East Coast. We will tell you all the hidden secrets and worthwhile attractions to visit during your stay. Your booking request has been sent successfully! 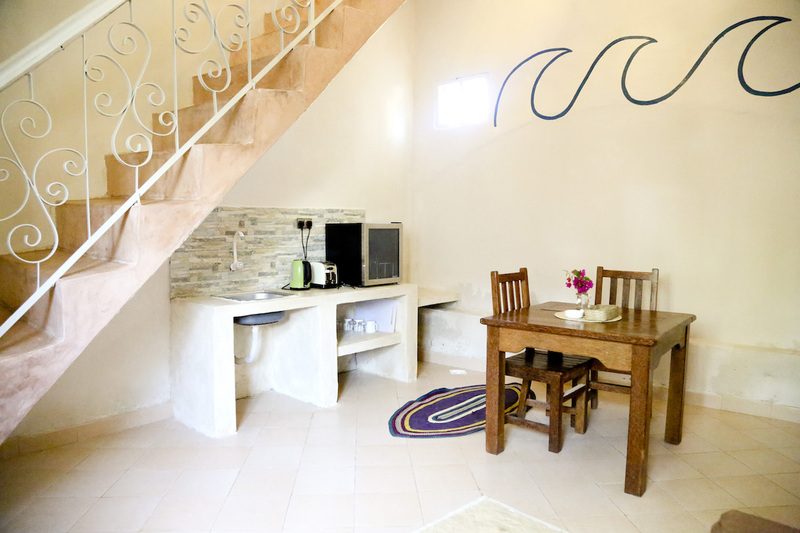 * It is possible to book the Single Room Option with 2 people or more, if everybody wants their own private room. ** The Double Room Option can only be booked for 2 people - if you choose this room as a single traveller the given quote will not be accurate as the room price is based on 2 people sharing a room. Choose your watersports packages below according to your plans. You can add even more activities in the next step. 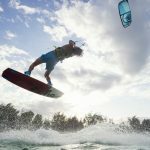 Kite Camp (beginner / refresher / intermediate) This course package is great for all level kiters. We will suit your lessons to your level. The Course includes 9 hours in a semi-private lesson or 5 hours private including gear. It depends on our availability if the course will be held private or in a group of 2. Please tell us in the comment field in Step 4 which level you have. If you bring your own gear you can book this package and we will add extra time to your course if own gear is used. 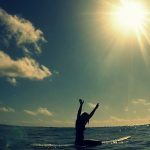 Surf Camp (beginner / intermediate / advanced) This package is a great choice for all wave hunters out there. The package includes 4 trips, which can be comfortably planned over a week stay with some break days in-between. If you are really wave hungry you have the possibility to add additional surf trips in the next step. Please let us know about your level and previous surfing experience (if any) in the comment field on Step 4. Kite Storage Only No need for lessons? <br> Book your Storage with us and take advantage of our beach service at the centre. <br> For stays over 1 week you can add extra days for storage in the next step. Just relax! Gimme no more. If you are booking as a couple or a group of friends and not all of you want to kite or surf, you can just choose the relax package, which means no more activities will be added to your deal. <br> This is also a great option if you want to take it easy and add just a few smaller trips and classes on to your package in the next step. Gimme more! 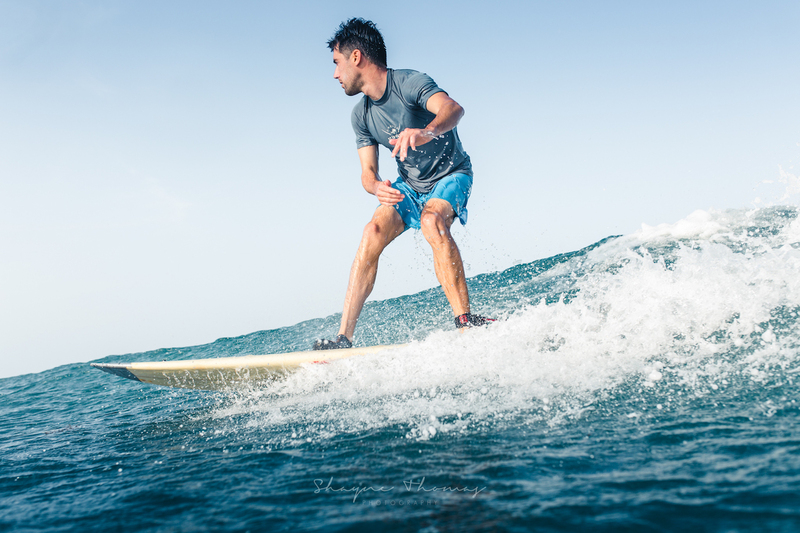 2 extra Surf Trips Add an extra 2 surf sessions and get your saltwater level up to the max. This is only possible and bookable for stays of 8 nights and longer! Please don't choose this package if you spend less time on the island as we will definitely be having a time problem otherwise! Kite Intro Course Great add on for surf packages of 7 nights or longer if you want to experience a bit of both worlds. 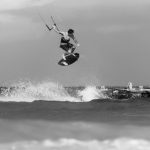 The Kite Introduction Course is a 3hr semi-private or 1.5 hour private course giving you a first insight in the sport of Kitesurfing. Surf's up! 4 extra Surf Trips Add an extra 4 surf sessions and get your saltwater level up to the max. This is only possible and bookable for stays of 11 nights and longer! Please don't choose this package if you spend less time on the island as we will definitely be having a time problem otherwise! The Booking Form is non-binding and will give you a good idea on expected costs for your package. Once your form is submitted we will hold your chosen room for 24hrs (If dates are available) and confirm all details with you via mail. The quote is based on High Season Rates. For stays out of High Season the rate will be discounted and we will send you your discounted offer after you’ve submitted your inquiry. Although we are updating all rates very regularly, the prices may change due to fluctuating exchange rates. When clicking on the Question Marks in the Booking Form you find lots of useful information about the different options and activities, that will help you to put together your perfect holiday package. 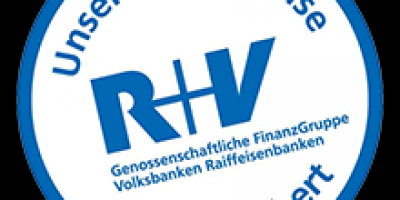 We speak english and german! Simply fill in our contact form and we will get back to you shortly.